Maxim MAX17633 Synchronous Step-Down DC-DC Converters are high-efficiency, high-voltage, synchronous step-down DC-DC converter with integrated MOSFETs operating over an input voltage range of 4.5V to 36V. 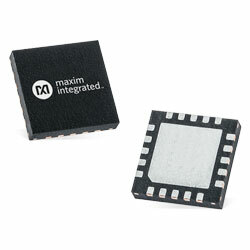 These devices are available now from Mouser and can deliver up to 3.5A current. The MAX17633A and MAX17633B are the fixed 3.3V and 5V output-voltage parts. MAX17633C is an adjustable-output voltage (0.9V to 90% of VIN) part. Built-in compensation across the output-voltage range removes the requirement for external components. The devices feature peak-current-mode control architecture. The device can be operated in the forced PWM, PFM, or DCM to allow high efficiency under full-load and light-load conditions. The devices offer a low minimum on-time that provide high switching frequencies and smaller solution size. Typical applications include industrial control power supplies, general-purpose point-of-load, distributed supply regulation, base-station power supplies, wall transformer regulation, and high-voltage single-board systems.